This piece below appeared in last week's Hafta mag. Picture courtesy is Cybernoon.com. One hoarding is placed quietly above City Bakery, Worli. It reads “Italian marble, German kitchen, Swedish wood.” Pause. “Indian landmark”. The other – and larger – hoarding opposite Cadbury, near Mahalakshmi Temple, reads “Of course, you’ll look down on your neighbours”. Pause. “We’re Bombay’s tallest building”. Both ads also mention “Address. By invitation only”. 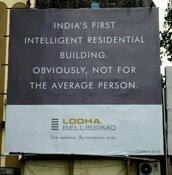 You do need to be someone to buy a house at Lodha’s Builders new skyscraper – “Bellissimo”. That’s Italian for gorgeous. At the going rate of Rs12,500/sqft, a 2,000sqft flat (don’t ask for a smaller flat, they have none) in this spiffy skyscraper, would put you back by Rs2.5crore. And that excludes parking, which could cost about Rs5lakhs. Yes, a crore just doesn’t fetch that much nowadays. Archaic regulations such as the Urban Land Ceiling Act (ULCA) and Rent Control Act, and a clear lack of resolve on the part of the many State Governments to amend these, have been among the factors responsible for Mumbai’s astronomical real estate prices. CB Richard Ellis estimates office rent in Mumbai CBD at US$55/sqft/annum - almost on par with midtown Manhattan, New York. On the ULCA in particular, the Maharashtra State Government finds itself in a messy bind. The Jawaharlal Nehru Urban Renewal Mission (JNURM), which was launched by the Central Government to develop major Indian cities, requires the ULCA to be repealed if Maharashtra is to get funding for vital infrastructure projects for Mumbai. While other states, faced with a similar situation, have agreed to repeal the act, our dear state continues to dither and drag its feet. Scrapping of the act would mean that the Government would lose control over land tracts, which would then become available for development. Supply of land is another key constraint. The redevelopment of Mumbai’s Mill Lands was finally cleared by the Supreme Court in a controversial case over 400 acres of prime Mumbai property. These are currently occupied by financially unviable mills belonging to the National Textile Corporation as well as textile companies like Bombay Dyeing, Century Textiles, etc. While a part of these mill lands had been sold to a clutch of builders in June/July 2005 – including Lodha, who’s Bellissimo will be built on the Apollo Mills land – a large portion of the land, eligible for development, is yet to hit the market. Optimists are of the hope that supply of these lands would bring down property prices over the next couple of years. Opening up of the salt pans in Wadala – another controversial issue – has run into trouble with various bodies like the MHADA, the Maharashtra Chamber of Housing and Industry and the Bombay Municipal Corporation taking different views on development of these lands. Talk of opening up of the Bombay Port Trust’s lands remains largely in the air. Even as central and eastern Mumbai gear up for a potential change in landscape, the suburbs have already undergone a transformation. Courtesy, builders who capitalised on the concept of Transferable Development Rights (TDR). Introduced in 1991, TDR was given to builders in return for surrender of their lands to the state for public purposes such as roads, schools and slum rehabilitation projects. Loosely translated, the TDR allowed builders to develop land in Mumbai’s suburbs. But with land already in shortage, where would the developers build? The answer, courtesy this time of a higher floor-space-index (FSI), was on top of existing buildings as well as erecting new, and taller, ones after demolishing the older and smaller buildings. TDR was also acceptable to housing societies who gave up their property to get additional land in the new structure and a fat cheque from a corpus handed over by the builder to the society based on the area of its building. Bandra is among the best (worst?) examples on the use of TDR. It now bears an entirely different look, thanks to an average three floors being added to most of the existing older structures. Obviously, this development came without any increase in infrastructure. Consider this – in 1991, Bandra’s population density had already risen 40% over a decade to 50,000 people per square kilometre as against 19,000 in Colaba. While the current number for that statistic is not available, Bandra’s current state of congested roads and traffic jams – representative of almost any other suburb – shows that things have only gotten worse. A study conducted by Mark Thornton at the Ludwig von Mises Institute (USA) stated that “construction of skyscrapers that qualify as the “World’s Tallest Building” tends to coincide with the major downturns in the economy.” He pointed to a “skyscraper index” created by economist Andrew Lawrence that showed that the Great Depression of the 30s in the USA coincided with the completion of the Chrysler Building in 1930 and the Empire State Building in 1931. No prizes for guessing the link here. The snazzy (snobbish?) Bellissimo ads have come roughly around a collapse on the BSE Sensex. However, the overall health of the economy seems to be in shape and the sharp Sensex decline has been attributed to a global correction in equity indices following fears on rising interest rates et al. To be fair, on the last two trading days of last week, the Sensex did rally up by about 10%. For their sake, M/S Lodha should hope that this optimism lasts. Or else, on hindsight it would seem that they – and perhaps all of us – were living in interesting times. Chinese curse style interesting times. 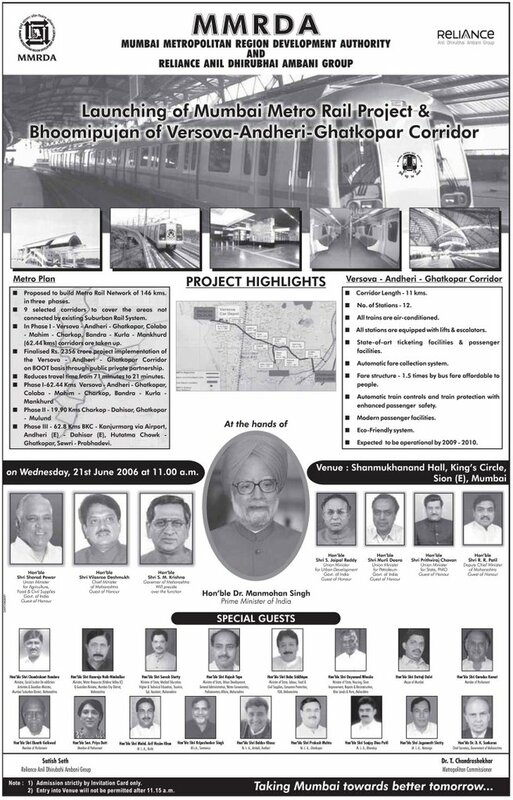 This full page ad was carried in today's dailies. 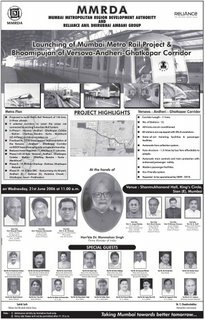 As we speak, the Prime Minister Dr. Manmohan Singh has laid down the foundation stone of the Mumbai Metro, in particular the Versova-Andheri-Ghatkopar leg. The one person who didn't make it to that list of illuminaries was Dr. T. Chandra Shekhar, Metropolitan Commissioner, MMRDA, and the man who, arguably, pushed the Mumbai Metro-Reliance Energy Deal through. Dr. Chandra Shekhar has also been credited with the transformation of Thane. In short, a man with an established track record. A man widely seen as capable of getting things done. The one person seen smiling in that ad is Mumbai Regional Congress Comittee Chief, Mr. Gurudas Kamath. This probably isn't surprising given that a few days back Mr. Kamath was demanding the ouster of Dr. Chandra Shekhar following allegations of corruption and over the poor quality of tenements given to people affected by the ongoing cleaning of the Mithi River. Despite this, Chief Minister Mr. Vilasrao Deshmukh (also the Chairman of the MMRDA) confirmed the appointment of Dr. Chandra Shekhar as the Metropolitan Commissioner. In this interview, the CM also seems to have given Dr. Chandra Shekhar a clean chit. Mr. Kamath is yet to give proof of his allegations. For enlightening himself, perhaps he should have read this brilliant post by Sonia Faleiro (which also points out to the fact that the MMRDA building and the NSE building sit next to the Mithi river - even as the MMRDA evicts slum-dwellers and even as the PAP who are legally entitled to R&R get neither) and Dilip D'Souza's Ambujwadi series. Work on the Metro, the Mithi River, the MUTP and MUIP is bound to affect people staying in these areas. That the Government is making a mess of the R&R work came into the spotlight when the World Bank pulled the plug on funding of the road component of the MUTP. With full-page ads like today, it does seem like the issue of R&R of PAP is getting drowned in the noise created by the Congress over the development (hic! transformation!) of Mumbai. Development being driven by projects that gathered dust for more than 20-30 years. Like the Mumbai Metro, the Bandra Worli Sea Link and the Trans Harbour Link. Coming back to the Mumbai Metro, it's clear that the Congress wants to raise the decibel level on this huge project, after its debacle on the 26/7 floods. Needless to say, it's also got an eye on the elections at the BMC due next year. The BMC, currently run by the Shiv Sena-BJP, is still coming to terms with its own share of blame for the 26/7. The heavy downpours earlier this month didn't show them in a very good light, as its own disaster centre plunged in darkness even as Mr. Johnny Joseph was assuring the press elsewhere that the situation was ..er... under control. Aside. The Shiv Sena turned 40 recently and Supremo Bal Thackeray celebrated in true style, calling for the help of Naxalites to tackle terrorism. End of Aside. Major development projects have their own share of politics. It's as true for the country as it is for Mumbai. In commencing these age-old projects, the MMRDA is finally kick-starting the process of developing Mumbai's infrastructure. However, the path won't be easy given the multiple problems involved and the need for integrated solutions. Walking the thin line between development and politics, Dr. Chandra Shekhar and the MMRDA are bound to face further controversy. So, perhaps it's a good thing that he was not featured in that ad. He'd almost seem like the perfect fall guy. This piece on Mumbai's locals appeared in the current issue of the Hafta mag. Everybody’s got a story about Mumbai’s local trains. From those pushed back after daring to get out at Andheri in a Virar fast, to those enduring the blare of the bhajan mandals. Hindi movies have shown romance blooming in local trains – from a virile Amol Palekar courting a shy Tina Munim in “Baton Baton Mein” to an insipid Vivek Oberoi proposing to a spunky Rani Mukherji in “Saathiya”. However, try romanticising a Mumbai local train journey to a daily commuter, and you’re likely to receive one tight slap. Reality is closer to a haunting scene from J. P. Dutta’s “Hathyar” which showed Sanjay Dutt seeing his dead father lying in between railway tracks, amidst the whizzing locals. (And before you ask, local train accidents in Mumbai are estimated at anywhere between 3,500 to 4,000 every year, half of which are on the rail tracks). Mumbai’s local rail system is among the largest in the world. In terms of traffic, the Western and Central Rail system carry an estimated 6m people everyday. To put things in perspective, the New York Metro North Rail carries 6m people in a month. 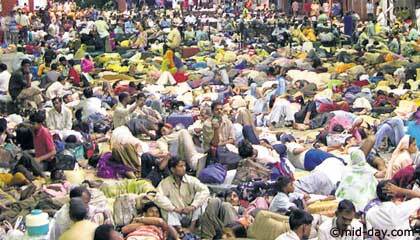 Mumbai doesn’t sleep much and neither do its trains. The first train of the day rolls out of Virar at 03:26, about an hour after the last train for the day checks in there at 02:30. At Kalyan, the first train is out at 03:27 and the last train in at 01:14. Between themselves, both rail systems run close to 2,070 services to ensure a frequency of one train every five minutes. You don’t need statistics to tell you that Mumbai’s rail system is also among the most crowded in the world. A nine-coach rake with a carrying capacity of 1,700 people routinely carries 4,700 people during peak hours. This is what is defined as – and you will surely agree with this rather nice term – “super dense crush load”, which translates to about 1.4 to 1.6 people per square foot of floor space. And this does not include the space that enterprising Mumbaikars find on-top of the compartment, around the compartment (i.e. clinging on to windows), and even between compartments. Since inception, while rail capacity has been expanded 2.3 times, rail traffic has gone up – guess? – a whopping six times. Telling a Mumbaikar that the Government is doing something about this daily torture could in all likelihood invite another tight slap. Be that as it may, the two projects that could ameliorate the current situation are the Mumbai Urban Transport Project, Phase 1 (MUTP-I) and the Mumbai Metro. As per the Mumbai Metropolitan Regional Development Authority’s website, the MUTP has been formulated to...er… “bring about improvement in traffic and transportation situation”. The project cost of the MUTP is pegged at Rs4,526crores – or just under US$1billion. Note that 70% of the project cost – or Rs3,510crores – is dedicated solely to Mumbai’s Rail system. A separate company – the Mumbai Rail Vikas Corporation Ltd, which is a joint venture of the Indian Railways and the Government of Maharashtra will execute the rail component of the project. When completed, the MUTP will add 35% to local train capacity during peak hours and reduce the “super dense crush load” to about 3,000 people. This will be achieved by (a) adding a fifth line from Borivali to Mahim and (b) adding additional pairs of tracks between Kurla and Thane and Borivali and Virar. However, the MUTP suffered a major setback in March this year when the World Bank suspended it’s funding for the project. This followed issues relating to relief and rehabilitation of the project affected people (sounds familiar doesn’t it ? but no Aamir Khan here), resettlement of shopkeepers, demolition of houses for road-widening and functioning of a grievance redressal system. This is a text-book example of the multiplicity of problems and resultant controversies that surround a project of this size. As always, there will be no easy answers. As always, the Government finds itself in a problem of its own doing. While the rail component of the MUTP has not been affected by the World Bank pulling the plug, the road component (which includes crucial east-west link routes like the Jogeshwari-Vikhroli link and the Santaruz-Chembur link) has taken a hit. At last count, the fifth railway line has been laid between Santacruz and Borivali, and 45% of work between Kurla and Thane has been completed. Of pipe dreams and grand designs…. The Mumbai Metro Rail is another classic 30-year-old-in-the-making project. 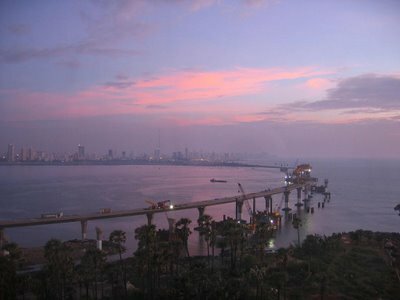 Its siblings include the Bandra Worli Sealink and the Mumbai Transharbour Link. However, after years of prevarication and lack of political resolve, one leg of the Metro – the Versova-Andheri-Ghatkopar (VAG) leg was finally cleared by the Government last month. But not without disputes – one relating to funding and the other to a choice between standard and broad gauge rail. However, even for the Metro, some experts were of the view that a sky bus would have been cheaper. Environmentalists also claimed that upgradation and overhaul of the existing rail networks would have addressed the transport problems better than spending a whopping Rs20,000crores on the Metro. In its final form, the 146km long Mumbai Metro would consist of three parts. Other than the VAG, the Metro would include a Colaba-Charkop leg and a Bandra-Kanjur Marg leg. Of course, you would have to wait till 2021 to see the entire network in its full glory. By which time, Himesh Reshammiya would have won the Grammy for Album of the Year. Or the Oscar for the Best Actor. Indeed, all these projects remain a distant dream for Mumbaikars. Yet, there is a lot still being done on the ground to get these projects moving. A lot that should have been done earlier, but is finally being done now. And till all these projects see the light of day, the average man on the street will continue to endure bland signs which exhort him to bear inconvenience today for a better tomorrow. Till then, hope remains a four-letter word. This piece appeared on the debut issue of the Hafta Mag. The photo below is courtesy Gurudutt Mohite (thanks!!). My own set of pictures of the BWSL from Bandstand can be found here. Sunsets in Mumbai won’t be the same again. At least for those watching it between Bandra and Worli. 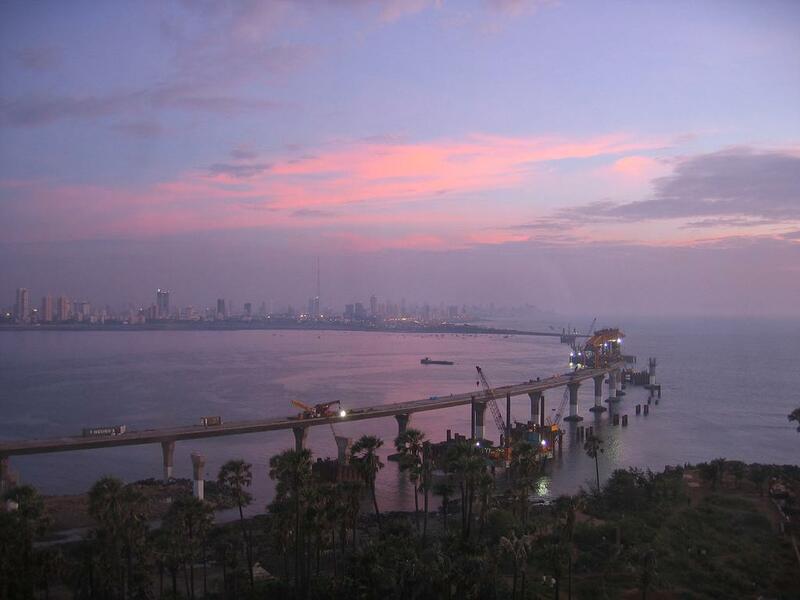 It’s hard to miss the pillars and the cranes jutting out of Bandra Reclamation which represent one of the most ambitious, and controversial, projects that the Maharashtra State Government has undertaken – the Bandra Worli Sealink (BWSL). In its final form the BWSL will be an eight-lane freeway running a length of 6km, which will start from Mahim interchange (remember that funny round-shaped structure at Bandra’s main junction?) and end at Worli Seaface. The BWSL will eventually connect to Nariman Point via the Western Freeway Sealink Project to complete an integrated road system connecting the island city to the suburbs. Hindustan Construction Company India (HCC) is executing the project that has been commissioned by the Maharashtra State Road Development Corporation (MSRDC). One key feature of the BWSL is that it is a cable-stayed bridge, making it different from other bridges in and around Mumbai like the Vashi and Thane-Airoli bridges. Occupying pride of place on the BWSL is a 128 metre-tall (as high as a 40-storey building) central tower on the Bandra side which will hold a 600-metre long stretch of road. A shorter tower, about 55-metres tall, will hold a 350-metre long stretch on the Worli side. That’s as close as we’re getting to the Golden Gate. While 33% of work on the BWSL has been completed till date, you have to wait till April 2008 for zipping these mean streets. What the project aims to resolve is something most Mumbaikars are painfully aware of. The ages taken to travel between the suburbs and the island city (or what the Mumbaikar knows simply as “town”). The BWSL’s website pegs the daily number of “passenger car units” (where one car is one PCU and a bus about 3 PCU) that ply on the hugely congested Mahim Causeway at 120,000 – a number which could do with some updation. The website also pegs the time taken to travel during peak hours from Mahim Causeway to Worli at 40 minutes – a number that definitely needs updation. Controversy and delay have plagued virtually every major infrastructure development project in Mumbai. Some cases in point include development of the Mumbai Mill Lands, slum rehabilitation initiatives, the Mumbai Metro and the Shewri-Nhava Sheva Transharbour Link. Needless to say, the BWSL is no exception. Originally planned as far back as 1983, some say even earlier, work on the BWSL was finally cleared in 1999. Between then and now, the cost of this project has doubled from Rs666crores to Rs1,306crores. Public Works Minister, Mr. Anil Deshmukh attributes the cost overrun to realignment of the bridge, made necessary to accommodate the Worli Fishermen who are among the most vocal critics of the project. The Maharashtra Machhimar Kruti Samiti has fought and lost a battle against the BWSL. Ttill this day, despite statements made by Mr. Deshmukh, the community remains unhappy over the project given its impact over their livelihoods. Environmentalists form the other major community that over time has protested against the BWSL. 26/7 bought these concerns to the forefront. While the State Government conveniently blamed the weather for this disaster, warning signs were up a long time ago. Environmentalists like Bittu Sahgal, editor Sanctuary Asia, believe the BWSL was one such sign. As long as back as 2001, the Indian People’s Tribunal on Environment and Human Rights had investigated the necessity of the BWSL. In an oft-quoted and ominous observation, they stated “By disturbing the natural course of events and redrawing the geography of the Mahim creek, the link has gradually upset the flow of effluents and floodwaters that drain in the Arabian Sea. Experts say that this turn may cause the Mithi River…to back up and cause inordinate flooding along adjacent areas”. Another doubt over the BWSL is whether public money is better spent in improving mass transportation systems like local trains and buses. Or for that matter, does the BWSL encourage use of personal transport in a city increasingly getting clogged by more and more vehicles? To put things in perspective consider this – There were 1.1m registered vehicles in Mumbai in 2003 and an estimated 250 vehicles are said to be registered per day. A W. S. Atkins study commissioned by the MMRDA in 1994 stated that more than 80% of Mumbai’s commuters use public transport, as against 10% that use private transport. Despite all these protests and doubts, the Maharashtra State Government remains firm in its resolve to complete the BWSL. Bids for phase II, the Worli-Nariman Point link, are also expected to be invited soon. And therein lies the key. Is there really a point to travelling on a flashy road cutting across the sea, only to be stuck all over again in a jam at Haji Ali? Or will the Peddar Road Flyover resolve that issue? But with this controversial flyover due to be completed only in 2009 and the Worli Nariman Point Sealink by 2010 (per stated deadlines, which, as we’ve been constantly reminded are prone to painful delays), there appears to be no easy road ahead for Mumbaikars. Mumbai’s very own first online magazine – the Hafta – has gone live today. Yours truly is part of the Metropolis team. A collective effort of some of the best writing talent in the blogosphere, the Hafta packs a mean punch. It is also presents a platform for those who want to write about the issues that affect Mumbai. If you have something to say on these key issues – which could be anything from its traffic jams, its problems, its people and its places – do mail me at bombayaddict[at]gmail[dot]com. For further details, please check our clarion call. So, without further ado, we present the Hafta mag. Indeed, the monsoons have arrived. This is what happened last evening after heavy rains and downpours hit the city (201.2mm in Colaba and 143mm in Santacruz - on Day #1, as per Indian Express). Western Railways – 19 trains cancelled. Trains ran anywhere between 5 to 35 minutes late. The WR PRO says “The problem was in the Goregaon-Malad stretch”. Central Railways – Trains ran 40 minutes late after being stalled between 6.40pm and 7.30pm as lightening struck an overhead equipment wire between Ghatkopar and Kurla. Roads – Water-logging at S. V. Road at Khar and Santacruz, LBS Marg, Kurla, Hindmata Dadar, Subways at Malad and Santacruz. Incomplete pre-monsoon work led to flooding in Goregaon, Jogeshwari and Kandivali. Note that June 5th was the deadline given by the BMC to complete all digging work. Mohan Kadam (Chief Engineer, Roads) says “If we get a dry spell, we will open all these stretches to traffic within a day or two”. Finally, Mr. Joseph adds – “Ward officers, assistant engineers in each ward and all senior officers are monitoring the situation and are prepared to handle the situation”.